On a freezing cold Montana morning, I was riding on a quad at the Yellowstone Club while listening to the distant booming of avalanche-control explosives. It made me think about that disastrous night on the Titanic when a lot of women passed up dessert because they were dieting. Unexpected things often happen, which brought my thoughts to 1978 and one of my filming trips to Austria. "Life—especially life in the mountains— is fickle. Enjoy every moment you can." For the first time in eight days, a raging blizzard had eased. Under a clear sky and the brilliant morning sun, the far-off thunder of avalanche-control work woke me up as nearly six feet of new snow began to settle. Looking out my second-story window onto the narrow street that bisects the small alpine village of Zürs, I noticed the 8 o&apos;clock Post Autobus had just arrived from Langen. The driver was on the roof, rummaging through a pile of luggage. Waiting impatiently were two pale-faced Americans. They were complaining about how tired they were after their travels to this village high in the Arlberg. "It&apos;s OK, George," I heard one say. "Our wives will be along on the 12:45 bus from Langen. They probably have your camera case with them." I could also see Old Herbert standing where he had stood every morning for the past 58 years, smoking his pipe, waiting for the ski school pupils to show up. Dividing up the pupils would be easy. Most could be sorted by gear. "That one will be a racer in 10 years," he&apos;d say. "This one will never be able to keep up with that secretary he claims is his wife." "And those Americans covered with zinc ointment? They&apos;ll be pooped by lunch." The two Americans arrived at the summit with their class, tired from the long trip but running on adrenaline in anticipation of the long powder snow run down to Lech. On an outcrop high above the lift terminal, a herd of chamois could be seen foraging for food. An extra large one stood out in relief against the skyline. The class started off in single file, following in the tracks of their instructor, Otto. After skiing down for a mile in the delicious untracked powder, Otto halted his class in a meadow. Wise in the ways of the mountains, he had stopped on a ridge that formed a safe haven. Otto pointed out a small speck, high above their tracks. "It&apos;s that big chamois we saw above the top of the lift." Several class members were getting their cameras out when the chamois started moving smoothly downhill, then tumbled and disappeared in a billowing cloud of snow. Two hundred yards behind the class, the two Americans were swept away by the avalanche, now 10 feet high. The avalanche had barely come to a halt when Otto began to dig furiously. Miraculously, both men were alive, but injured and in shock. Half an hour later, the ski patrol arrived. It took another half-hour to get the two medicated, splinted and strapped to the toboggans for the run down to Lech. In Lech, they were loaded into an ambulance for the ride back up to Zürs, over the Flexen pass, then on to Bludenz. They would probably have to stay a couple of days in the hospital, then spend the rest of their vacation sitting in the sun on the porch of the Hotel Lorensur, watching their wives ski. But on the big S-turn on the southwest side of the Flexen pass, at 60 mph with the siren screaming, the ambulance hit black ice and went into a semi-controlled skid that almost missed the 12:45 Post Autobus from Langen. The bus only had two passengers on board, two American women. One had a camera case in her lap. Ricocheting off the bus, the ambulance spun twice, punched a hole in the guardrail and executed a twisting arc that is still talked about in the Arlberg almost 30 years later. With its two avalanche victims inside and its siren screaming, the ambulance flew almost 500 vertical feet before hitting the rocks. I think we&apos;re all aboard a trip on the Titanic, except it&apos;s called life, so don&apos;t pass up dessert whenever it is offered. Warren Miller's essay on the history of how many iconic ski areas were built. Warren Miller and an evening spent dining with a French governor. 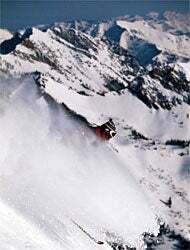 Accidents in Chamonix have come a long way since Warren Miller's visit many years ago. "Mogul: A hugely successful tycoon who is in any business but skiing," and other clever Warren-isms guaranteed to make you smile. Want to get more people into skiing? Warren Miller proposes making it more like the drug business.